Jamie Davis, a British student in her third semester of the CUNY Baccalaureate for Unique and Interdisciplinary Studies program, popularly known as the CUNY BA program, said her first week of classes “was a bit hectic” due to a class registration problem. She was one of several people interviewed about their early weeks of the semester as part of a series of WORD stories about the campus starting its new academic year. Growing up as an undocumented teenager in a country that portrays me as a criminal has been a challenging experience, like I’m not wanted in the country I live in. Time management should be an essential tool for students juggling classwork, studies, extracurricular activities, relationships, jobs, internships and family responsibilities, especially if they must commute long distances. 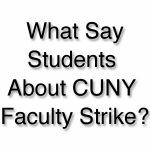 Six students interviewed for this story support the Professional Staff Congress in its contract fight with CUNY and said they would also support a strike despite the potential for cancelled classes, lost tuition or delayed graduations.